AMBROSONICS, LLC Specializing in Custom Music Products, Electronics and Design Services! "Specializing in Custom Music Products!" HD Audio Hybrid Analog Preamp with DSP! Description: This is an on-board Guitar or Bass Preamp System with HD Audio and 24 Bit Digital Signal Processing Effects. The HD DSP guitar preamp has fabulous sounds and is a high quality product designed and made in the USA. It features 15 DSP Effects, Stereo Headphone Outputs and optional iPOD inputs. A mini toggle, 3-position switch provides Clean, Analog Distortion 1 and Analog Distortion 2 allowing for 45 different sounds. The Analog Distortion levels and DSP Effects levels are also under your control! 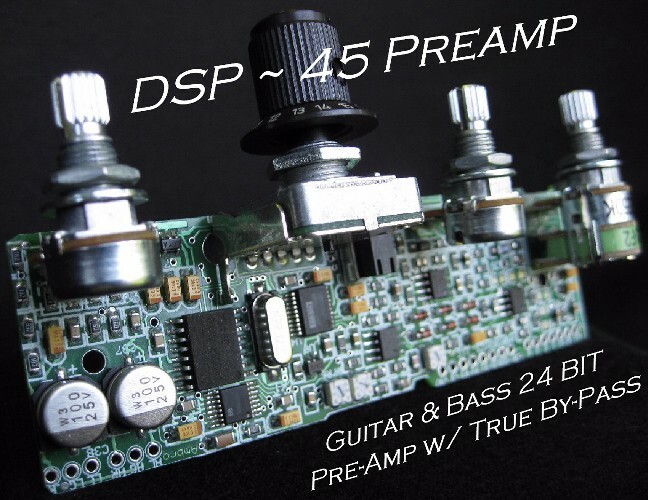 The preamp has a True By-Pass Switch for a passive non-preamp mode of operation. There is no 9 volt battery required in By-Pass mode. DSP Effects: Stereo Chours with Reverb, Deep Hall Reverbs, Delay 1, Delay 2, Room Reverbs, Tank Reverb, Vintage Reverb, Stereo Chours, Flanger, Slight Lesley and others. True Passive By-Pass Switch: A 3PDT Switch bypasses all electronics. The Master Volume control becomes a passive volume control!